This section makes up the majority of my knife collection. 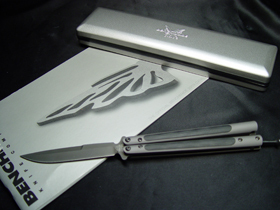 If you would like to know more about balisongs in general, I suggest checking out my balisong site--BalisongInfo.com. You can tell how much time I devote to these knives by the amount of effort put into the BalisongInfo site. It has become more than just a hobby--balisongs are a passion. Because this section is so large, I have chosen to forego the thumbnails here and just list my balisongs in text form. If you would like to see the thumbnail page (dialup users beware), then you can click here. In any case you can click on a specific model to see more information about it. This will open up a popup window so you may need to allow popups for this site. Due to the large number of Benchmade balisongs and their popularity, I have chosen to list the Benchmades first.